Pride comes before a fall. Until recently the UK co‑operative movement had plenty to be proud of. In 2012 the wider sector turned over almost £37 billion and grew faster than the UK economy. The largest co‑op, the Co-operative Group, successfully acquired the Somerfield supermarket chain in 2008 and the Britannia building society in 2009, reversing years of relative decline since the 1960s when co-ops had a 25 per cent market share. In this context the ambitious bid to buy 632 branches from Lloyds TSB seemed to make sense. 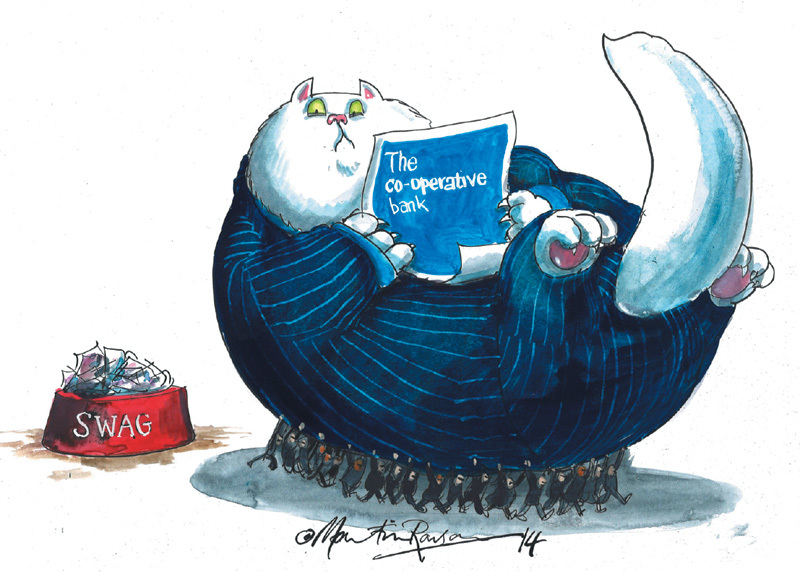 Instead, in less than a year, multiple crises have left the Co-operative Group with just 30 per cent of the bank it used to own. That things had seemed to be going so well may explain the stunned silence from active Co-op members. The Co-op’s democratic leadership maintains it was a choice between accepting minority ownership of the bank or losing the whole Group – shops, funerals, the lot. With no organised democratic challenge to what was happening, customers and members could either acquiesce or leave. The Save Our Bank campaign, launched with the support of Ethical Consumer magazine, offered an alternative for customers who wanted to act collectively. The campaign drew on two key facts. First, the Co-op Group leadership appeared to have persuaded the hedge funds that an ethical stance was needed to retain customers. Second, by abandoning the bank, the most motivated customers would have no influence on how things developed. The bank would lose its ethical policy and would never see a return to co-operative ownership. Save Our Bank’s response was to say ‘don’t switch yet’. The campaign would use ‘crowd power’ in pursuit of two aims: preserving a meaningful customer-led ethical policy, and enabling an eventual return to majority co-operative ownership. This straightforward message of hope has resonated with many thousands of customers, but it disguises the bigger challenges now facing the campaign. Of nearly 2,000 supporters who completed an online survey, more than half said that preserving the ethical policy should be the initial focus of the campaign. Some, particularly among the larger NGOs and charities that signed up to the campaign’s ‘ethical policy declaration’, believe a return to mutual ownership is at most a long term aim and may be unachievable. However, in the same survey, 70 per cent said that only mutual ownership could guarantee a real ethical policy. The campaign’s simple message of hope faces a conundrum: how can the ethical stance be preserved with the hedge funds in control, and how can the Co-operative Group ever regain ownership of the bank given the amounts of money involved? These may be the wrong questions, however. First, the hedge funds do not have a majority share as many assume. There is a mix of owners, some of whom understand that the bank needs a real and credible ethical policy to retain customers. The campaign can help focus their minds by acting as a kind of union of Co-op Bank customers. To work well this strategy needs a credible threat of a mass switch. So it makes sense to hold discussions with potential alternative mutual or ethical providers, while holding to the ‘don’t switch yet’ message that tells the owners that it’s worth listening. Second, regaining co-operative control of the bank may not require the Co-operative Group to invest precious capital buying back from the hedge funds. An astonishing 62 per cent of respondents to the campaign survey said they would be prepared to invest their own money to help re-mutualise the bank. The co-op could have turned to its own members before private investors to fill the gap in the balance sheet – and it could still pursue this option. A promising alternative would be for members and customers – perhaps including some of the third sector institutions that bank with the Co-op – to create their own fund. A co-operatively-controlled fund could play a number of roles. As a minority shareholder it would carry influence in the bank and could help call management to account – arguably where the democratic structure of the Co-operative Group has failed. But it could also play a more direct role, perhaps drawing on the experience of continental mutuals, where national institutions are made up of smaller, locally controlled regional banks. Some European mutuals have raised the possibility of cross investment as a way of strengthening mutual balance sheets. Just as the Save Our Bank campaign has been built entirely online, a new fund could use crowd‑funding techniques and play a part as an investor in the small and start-up enterprises that are the motor of economic growth in 2014. The campaign faces challenges, but it has plenty of options.